Read also "Jane Austen" and "from Pride and Prejudice" (Damrosch 1020-1022) and Hannah More, "from Strictures on the Modern System of Female Education" (Damrosch 269-275). Genre. For the most part, Persuasion is a comedy of manners, a genre which depicts the social relations of a particular class of people. Although the novel features main characters, it is not about how one central character becomes a success or finds herself, as in many American novels; rather, it is about how the central characters function within the society around them. Austen concentrates on the gentry and on the specific problem of marrying off eligible young ladies. As you read, think about ways in which Persuasion is like or unlike our current soap operas, romance novels, and / or TV sitcoms. Class. Austen depicts the gentry, whose members include landowners, lawyers, Anglican parsons, officers in the army and navy, and country doctors. The upper reaches of this class join the aristocracy, who consist of large landowners with hereditary titles ranging from Duke down to Baronet. The lower reaches of the gentry extended to the middle or trading class, made up of shopkeepers (butchers, tailors, grocers, haberdashers, etc.). Below the middle class were the lower class or the poor, who were tenant farmers, servants, or labourers. (After the Industrial Revolution they will also be factory workers, but they do not appear in Austen's novels.) A person's class can be distinguished by noting his/her dress, educational level, accent, and (often but not always) income. Austen satirizes class snobbery throughout the novel, beginning with Sir Walter Elliot's obsessive re-reading of his family's history in Debrett's Baronetage. Why do you think people would become obsessive snobs in such a society? In what ways do you think his "vanity" (4) is like or unlike the pride that is censured by Pope and Swift? (7) accomplishments = singing, piano-playing, watercolor painting, dancing, conversation, etc. See pp. 28, 31-32, 99, 124. (18) Mr. Elliot must ever have the precedence = his noble rank must receive proper recognition and deference. See pp. 14, 31, 50, 58, 66 (naval hospitality), 85. (19) she was persuaded --Notice how the words "persuade" / "persuasion" are used in the novel. Key occurrences of the words: pp. 20, 41, 58-59, 78-79, 140, 163. (29) he did nothing . . . but sport = "he cared greatly only for hunting." Hunting is the only sport mentioned in Austen. (36) her brother's return = "her brother-in-law's [i.e., Charles Musgrove's] return." 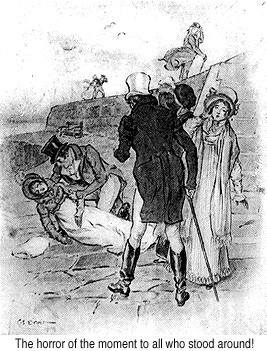 Characters in Austen will often refer to an in-law as "brother" or "sister." (56) she would as lieve be tossed out = "she’d rather be tossed out of the carriage than miss the ride." This is a comment about Admiral Croft’s erratic driving. (57) one of the ways to Winthrop? = "one of the paths to Charles Hayter’s house?" (58) on the step of a stile and (60) by the stile = a sort of step-ladder built on both sides of a fence. (British law allows walkers access through farmers' fields; these stiles, or step-ladders, help walkers go from field to field.) Compare / contrast with Wentworth catching Louisa as she jumps from the sea-wall in Lyme (73-74). (73) "dark blue seas" –the quote is actually from Byron’s The Corsair, line one: "O’er the glad waters of the dark blue seas." See p. 67. (89) ceaseless clink of pattens = wooden platform shoes to protect one's shoes from mud. (98) she remembered another person’s look –see p. 70. (99) a little learning is by no means a dangerous thing –Apparently, Jane Austen thought the opposite, since she admired Pope quite a bit. In a letter dated 20 Oct 1813, she jokes: "There has been one infallible Pope in the world." 1. Examine the first scene in the novel: what do you think is Austen's opinion of Sir Walter and his eldest daughter Elizabeth? What do you think is the author's opinion of Anne? Cite the text to back up your views. 2. According to Jane Austen, what makes a person "superior" or "inferior"? (See pp. 5, 7, 17, 25, 28, 50, 82, 99, 102-04, 121, 146-147, 161.) How does Jane Austen's view of these words differ from that of some of her characters? What do you think she means by the "solid" vs. the "superficial" (96)? 6. What is the proper way to find a husband? For example, why did Anne reject Wentworth long ago (18-19)? Why did she reject Charles Musgrove? 8. What do you think Austen wants to show by the scene on p. 54? 9. Try to figure out why Henrietta and Louisa want to go on a long walk (55-7). Pick a character and describe how his / her psychology shifts during the walk. (For example, what are some meanings of Wentworth and Louisa's discussion of persuadable vs. firm characters? [See pp. 58-60; 78-9.] How do Anne and Wentworth's peceptions of each other alter after this conversation?) Do you think Anne is correct when she thinks she has "understood" Wentworth (61)? 10. Conversation was a form of "social exchange" in the 18th and 19th centuries. What sorts of social exchange do you think the characters in the novel engage in when they converse? In what ways might conversation be connected to ideas of superior / inferior people (99)? What might conversation's purpose be in the structure of the novel? 11. Why doesn't Anne simply tell Wentworth that she's sorry and would like to start over? Do you find Anne a bit too self-sacrificing (77-79, 81)? How would you describe her character? 12. Why do you think Austen includes Benwick in the story? What do you think is the importance of poetry (56, 67, 73, 110-11) to Benwick and Anne? 13. Do you find Capt. Wentworth's confusion after Louisa's accident wholly believable? 15. One critic finds the use of "persuadable" on pp. 78-79 to be the "key use" of the word in the novel. Do you agree or disagree and why? (Other key occurrences of the words: pp. 20, 41, 58-59, 78-79, 140, 163.) What do think Austen is saying about being "determined" vs. being "persuadable" (passion vs. reason)? (Who in the novel is "persuadable" and who is not? Why?) What do you think of Anne’s and Wentworth’s reasoning on p. 164? 16. Many critics say that Anne and / or Wentworth "learn romance" (21) in the course of the novel. (See Tanner 231-264 and Ann Astell's essay 275-285.) What do you think Austen means by "learning romance" and what do you think of the critics' views? What do you think Anne and Wentworth learn about romance and reason, personal emotion and societal duties? (cf. pp. 66, 82, 92, 97, 106, 111, 147, 150, 164). 17. What sort of "double game" (167) was Mr. William Elliott playing? 19. Discuss how character and perception changes in Anne and Capt. Wentworth. Discuss ways in which perceptions and making distinctions, are important in the novel. For example, in what ways could this book have been titled Persuasion and Perception? Who lacks perception—when and why? 20. Find examples of Enlightenment and / or Romantic ideas in the novel. 21. What are some ways of explaining why this (somewhat satiric) novel is so much better-mannered and more genteel than Swift's Gulliver's Travels? 22. What do you like about reading Jane Austen? candour now: frankness, bluntness. In JA: warm sympathy, freedom from malice. curate = priest in the Church of England. fond = often in JA, "hopeful, wishful" (see p. 21). mind now: brain or intellect. In JA: implies the essential inner qualities of self, not just intellectual ones.nice now: pleasant, agreeable. In JA: exact, precise or particular, choosy (see pp. 20, 42). respectable now: narrowly conformist. In JA: deserving respect. sensible now: reasonable, rational. In JA: often, conscious, aware. sensibility = sensitivity, "quickness of perception; delicacy" (Johnson's Dictionary). stout now: inclined to fatness. In JA: in good health, firm in opinion (as in "she stoutly declared"). 1. Compare / contrast her depiction of women's situation with the ways in which Jane Austen depicts the women in Persuasion. 2. In what ways is Wollstonecraft's treatise characteristic of the Enlightenment? Of Romanticism?